GlenBrook Health Center, 1950 Calle Barcelona in Carlsbad, has always known pets play an important part in people’s lives, no matter at what age. This year, after attention drawing studies done by the Alzheimer’s Association, they have introduced some new pets. The difference is that each of these new pets has 4 C 1.5 Volt Alkaline Batteries. Dementia studies began several years ago and were based on the already known fact that many people with this disease witness times during the day when they become anxious or upset without apparent cause. It was shown that petting their cat or dog could assist in reducing stress, anxiety, agitation, irritability, even depression. The studies continued with the use of robopets, and impressive results were found with companion pets as well, and were occurring without the necessity of feeding and clean-up. 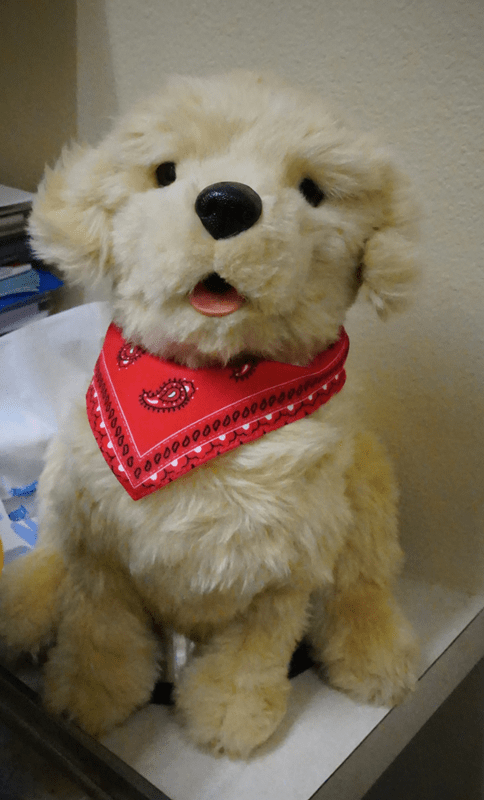 GlennBrook and their administration began investigating the feasibility of these companion pets and after thorough inquiries decided to implement these companion pets into their memory care unit. The cat moves its head, meows, and seeks attention. It looks feels and sounds like a real cat. Its soothing purr is so authentic that even the most skeptical respond to it. Its coat of fur is artificial though it feels authentic and is non-allergenic for those allergic to cat hair. It responds to petting, hugging and motion much like real ones while not requiring the special care, feeding or vet bills. The dog’s built-in sensors create gentle breathing and heartbeat features, as well as movements which mimic real pups. It responds to presence, voice, and touch. Whether a cat lover or a dog lover, each has the beloved characters of that favorite pet of long ago and is now remembered in ways not yet fully understood. 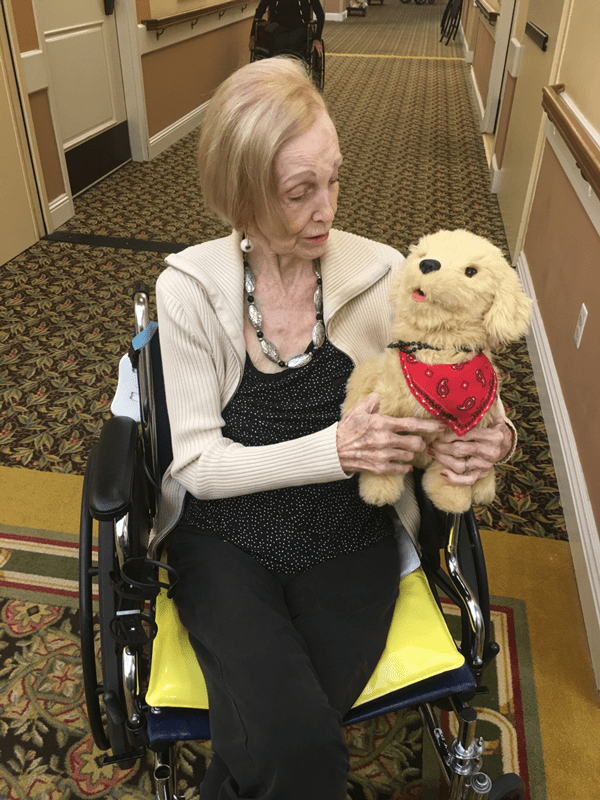 Naomi Slyder – a resident of GlenBrook – was introduced to the golden retriever ‘puppy’ early in the program. She named it Ruffles as this was the name of her real-life pet for many years. Naomi’s response has been impressive, smiling with her eyes now. She has become very attached to Ruffles. The staff has observed other advantages from the interactions with these companion pets. Residents appear to have fewer anxieties and irritabilities when they have them. Pets, whether real or those with A.I., are not judgmental or critical, and appear to give a sense of predictability once enjoyed by having had real-life pets. GlenBrook’s’ policy had always encouraged new residents, entering the assisted living division, to bring their cat with them. As the patients aged -in-place, the responsibility shifted from the owner of the pet to the staff of the facility. This policy was abandoned to provide proper care to the people, not the animals. Phil Padilla, assistant administrator, admits he was skeptical about the impact these robopets could provide, and has been extremely pleased with the results they are finding. As the longevity tsunami increases and younger ages decrease, healthcare providers are examining how A.I. can be of help in the most positive manner in the aging process. Whatever the setting, and whatever kind of animal, the magic of a favorite pet remains. They can make a big difference in the daily life of one with Alzheimer’s or other forms of dementia.